The road to justice isn’t always easy. We all know that. We also know that the road to our office each morning can be treacherous. Late last summer I was cited by the California Highway Patrol for an alleged violation of Section 23123 of the California Vehicle Code. The officer claimed that I used my cell phone while driving without a hands-free device, consciously disregarding the safety of my fellow travelers on Interstate Five. You can tell a lot about a place by the way the courthouse looks. In southern California there are magnificent old court buildings in Riverside and Orange County. They are architectural artifacts of a time when folks were proud of their public buildings and designed them to be part of comfortable plazas for everybody to enjoy. 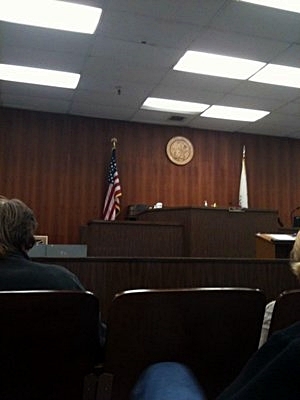 The local courthouse for my traffic trial is about as elegant as a trailer with a foundation. This bare-bones operation suggests that the locals don’t take much pride in their justice system, however it does seem to function reasonably well under the circumstances. 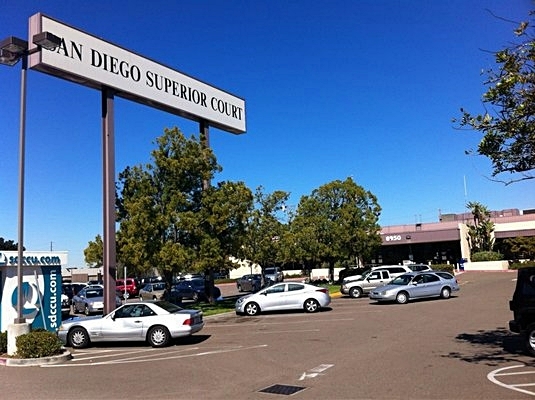 Now let’s all have a look inside Department A of the San Diego Superior Court. There’s nothing fancy about it, but it is a decent enough location for defendants to confront their accusers. One of the great things about being a licensed attorney is that I get to go in front of the bar and hand my business card to the bailiff. That means my case gets priority along with the other private counsel cases. I’m sure you have heard the phrase, “A man who is his own lawyer has a fool for a client.” This saying has interesting origins that go back more than a couple hundred years. Whatever. I’ve been a lawyer for almost thirty years and I’ve spent plenty of time cross-examining police officers and other witnesses. I know what I’m doing. I know how to argue cases with seemingly difficult facts. 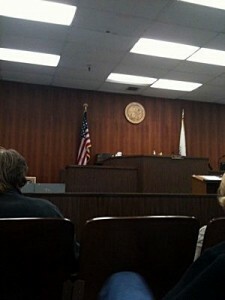 I showed up at court ready for action. OK, so it is true that the CHP officer did see me driving southbound on Interstate 5 in my Chrysler Sebring. It is true that he saw me holding my cell phone in my right hand. It’s also true that he saw me speaking at the same time I was holding my cell phone and at the same time I was driving. All of this is true. I admit it. But it isn’t the whole story. I deny that I violated Section 23123 of the California Vehicle Code. I insist on my day in court. Fair enough. What is my defense? These are pretty tough facts I’m admitting to at the start, aren’t they? Maybe so. Let’s look at the key language of the law. Section 23123 prohibits “using” a wireless telephone while driving unless it is hands-free. I brought a physical object with me to court to serve as a defense exhibit at trial: the hands-free device in my car at the time I received the citation. What happened was that I got a call while driving. I pushed the answer button and the hands-free device broke, pushing the phone into my hand and also disconnecting the call. I looked up to see the CHP officer gesturing for me to pull over and accept a nice yellow traffic citation. You be the judge. Do these facts constitute “using” a cell phone while driving? Should I be convicted? The judge called my case. I indicated I was ready for trial. The judge called the CHP officer’s name. Silence. “This case is dismissed for want of timely prosecution,” announced the judge. I walked out of court with my head held high, a winner at trial. Did I achieve justice? Who cares – I won! 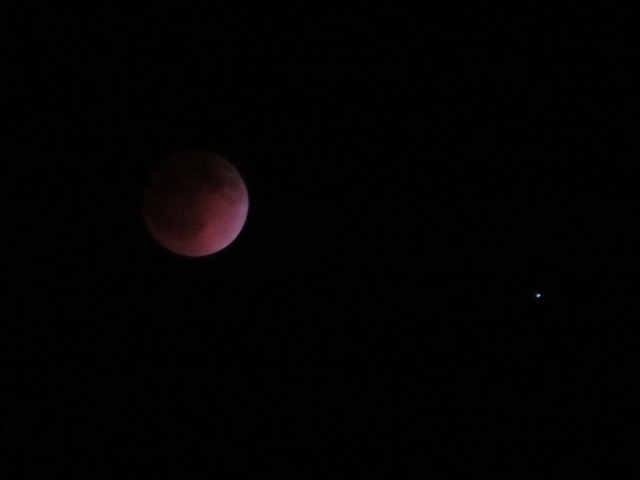 As seen from Carmel Valley, California, here is the Blood Moon Eclipse. What is a blood moon? Here is the answer. According to the Experts Who Know, all lunar eclipses are red, so this is nothing special. According to some successful religious book authors, this is part of a lunar tetrad and symbolic of End Times. Astrologers observe that imbalances explode when there’s a blood moon in Libra. October 7-8 will offer the next chance to see a blood moon, unless End Times come before then. Either way, you ought to live each day as if it’s your last…and one day you’ll be right! 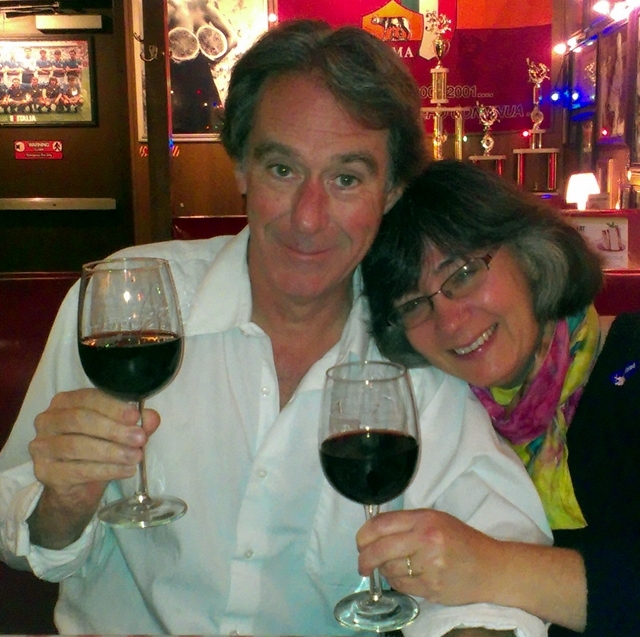 Forty years is quite a long time…at least I used to think so. Joseph LeConte was an early conservationist and a professor at UC Berkeley in the 1800’s. My friends and I went to a junior high school in Hollywood that carries his name. A group of us was given a chance to take a week-long field trip to Yosemite Valley. The school bought a super-8 movie camera and let me use it for the week. I shot five or six rolls of film during the trip, which I edited at home. The camera was able to shoot in slow motion, fade in and out and do cross-fades internally. Although I spent most of my time shooting film, I make a couple of cameo appearances in this movie. Some of us decided to go swimming in a very cold, wide stream. I’m the one who does a flip into the water. Some kids don’t have a lot of sense. It was great fun making this movie and showing it to various groups of students and parents. Back in the early 70’s it was quite uncommon for teenagers to make movies. These days we’re all accustomed to shooting HD movies with sound with our phones. Today’s kids are growing up with a vast personal archive of their personal experiences and moments. Older folks are not used to seeing moving pictures of themselves as kids. So friends, here is your chance to take a trip back in time to May, 1973. Our group even pays a visit to Yosemite Valley’s monument to Joseph LeConte, the Sierra Club’s LeConte Memorial Lodge, the first permanent visitor center in Yosemite Valley. Maybe you’ll see yourself or perhaps look in on one of your parents when they were 14. The first big pile of old reels from the Pearce Family Archive has resulted in a bit more than five hours of video, including a fair amount of stuff from the Renaissance Pleasure Faire in 1971 and 1972. Here is the first item from that archive. This movie was shot by my dad Gerry on Super-8 movie film back in May, 1971. Diane Webber is shown here on the main stage, late in the afternoon. This is the only movie film I’ve recovered so far from the big stage in ’71, but it represents only a fraction of the good footage of Diane. I’ve got fairly elaborate coverage of her performing on the small stage in 1971, some of it shot from two different angles at the same time. The real treasure trove of Perfumes of Araby material is from 1972. I expect to be able to piece together a surprisingly complete show from the spring of 1972. I think you’ll agree that the images from this 1971 Super-8 movie are surprisingly good. Those who knew my dad will appreciate that I ended up publishing this movie on Christmas Day – no doubt it would help him get into the true holiday spirit! And so I wish everybody all the best tidings of the season. Happy Christmas. Now then, can we please have some different music? Yes, belly dancing music would be just fine, thanks. Elana and Emily are singing at their mom’s surprise birthday party. Emily looks good in green, I think. 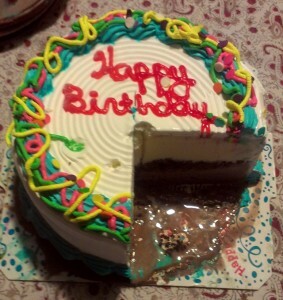 This was the happiest night of 2013 (so far). Here is a brand new Surface 2, the result of diligent shopping and careful research. Microsoft might have taken a billion dollar write-down on the first-edition Surface, but maybe this time around they will do a little better. So far I think this is a beautiful new product. Too bad they make it so hard to buy one! The new line of Surface tablet-laptop gadgets went on sale a month ago. They are beautifully packaged and the machines have a high-end, premium feel. I ended up buying mine at the San Diego Microsoft store, which is located in a wretched citidel of greed and materialism known as the Fashion Valley Mall. Although I don’t like malls I did like this store. They had plenty of display models of the various Surface products and several tables devoted to new Windows laptops and tablets made by other companies. The first time I went to look at the new Surface line, I ended up going to several different Staples stores and a few Office Depots, throwing in a side of Fry’s for good measure. Not only did these places not have what I wanted, the workers at the various stores appeared to have advanced-level training in “studied indifference” to people shopping for these devices! When I went to Microsoft store, even they didn’t have the new Type 2 keyboard in blue, which these days goes by the name of “cyan,” but they did take my email address and promise to be in touch when the accessory was in hand. Yesterday somebody from the store sent me an email telling me that I had 24 hours to come buy the item. When I showed up a few hours later the staff was friendly and helpful. I said I wanted to get a new Surface 2, and they took care to explain that this device is “a tablet not a computer.” I said I knew it ran Windows RT rather than full Windows. I’d thought about buying the Surface 2 Pro, but for $1,500 I could get a tricked-out new ThinkPad or Fujitsu desktop replacement. For my purposes, the Surface 2 will be more of a fancy netbook replacement. 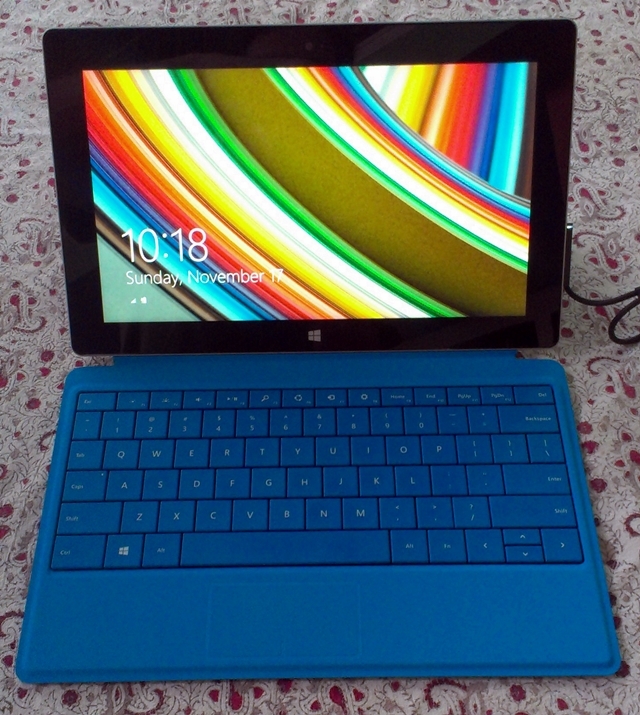 I bought the 64GB Surface 2 and the Type 2 keyboard. They threw in a free version one Touch keyboard, a nice move I appreciated. Setup was a breeze. From opening the box to being on-line and editing a Word document on Sky Drive took about five minutes. The screen is beautiful and responsive. The keyboard is a feat of engineering. Although the device is fairly large it feels lighter than you’d expect. Probably Microsoft expects Fashionable People to attract envy at cool coffee shops when they flash their new Surface 2 units. Instead they get customers like me. I’m sure the other folks at Denny’s ordering off of the Senior Menu will be most impressed with what a cool gadget I have! 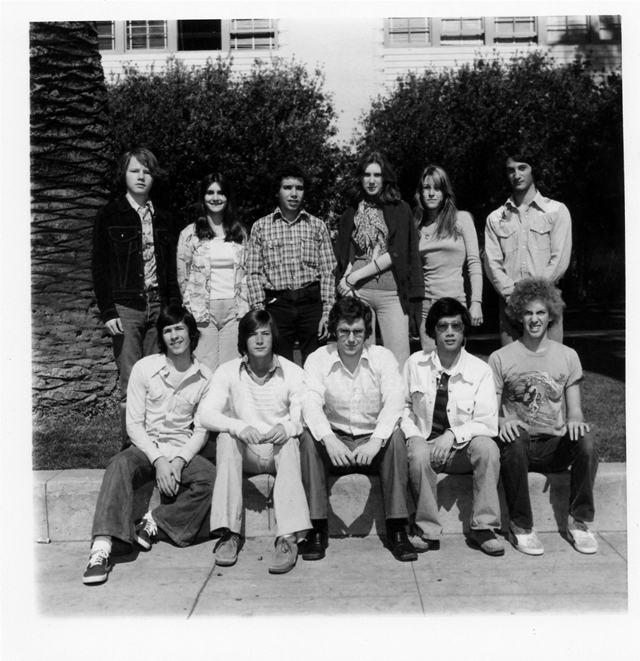 Here is a picture of the Hollywood High School Still Photography Club. This shot was taken on February 20, 1976. Here I am, front and center, the consequence of a discrete transaction with the photographer. Although I can identify most of the other people in this picture, I’ll leave it to everybody to tag themselves if they care to. 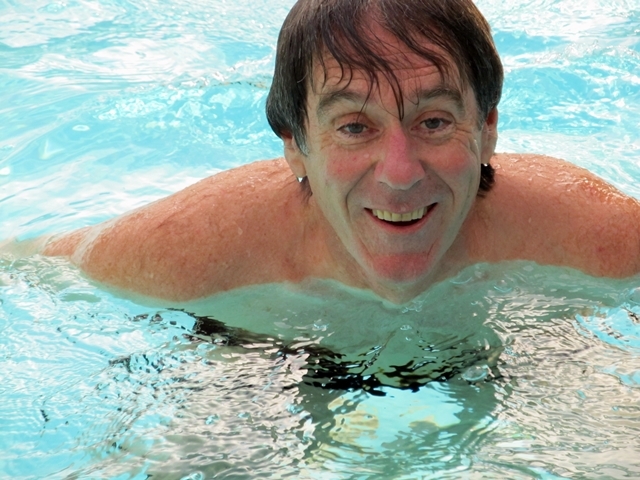 Isn’t it strange to see an old picture of yourself come from out of nowhere after 37 years? Surprise! How many of you have ever watched super-8 movies? These items are to video as cylinder recordings are to audio. During the 1970’s I spent many hours shooting, editing and watching creations made with this art form. 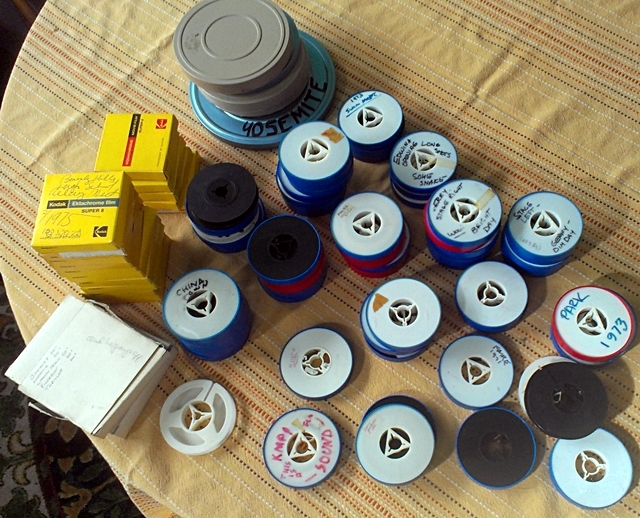 Here is a large pile of ephemera – 80 little reels of 40-year-old movies, half a dozen larger reels, and a couple of boxed 16mm movies from 50 years ago. This is the first lot that I am taking to be digitized. None of these movies have been projected in decades. What is going to be on this film? I imagine there will be plenty of swimming and diving on these reels, though I think most of the swimming footage is on different reels that have yet to see the light of day. The key movies in this lot likely will be from the Renaissance Faire from 1971 and 1972. Both my dad and I shot quite a few minutes of movie film of Perfumes of Araby, featuring Diane Webber. One little movie I hope to discover here is one I made with a couple of friends back in the early 70’s. Back then it was possible to hike right up to the Hollywood Sign on Mt. Lee. My friends were of Canadian heritage, and one of them had a nice maple leaf shirt on, so we decided that the movie would be a Canadian exploration of the Hollywood Hills in which the intrepid young explorers would claim the Hollywood Sign for Canada. How many of you would like to watch movies of yourself at age 14? After all, that’s the time of life when everybody is at their most attractive! At least a few will get the chance fairly soon, because one of the movies in this pile of reels is one I made at Yosemite back in the spring of 1973, on a school field trip with a lot of bright kids. The school bought a Yashica LD6 which I got to use on that trip. “Nostalgia is a longing for something you couldn’t stand anymore.” Soon I will offer more proof! 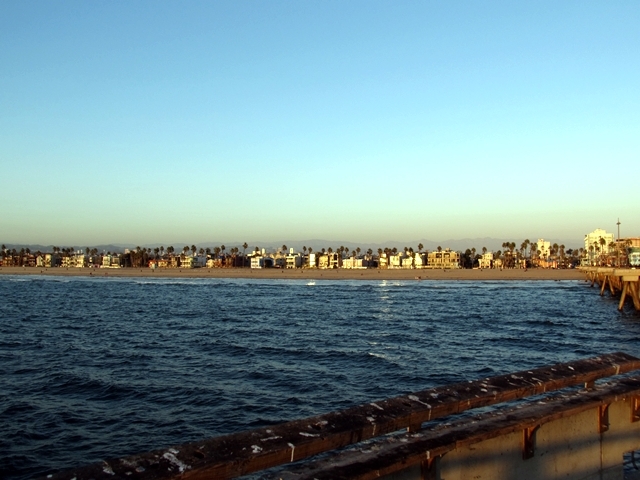 Here’s a shot from the end of the Venice Pier. I spent the better part of 20 years living in this neighborhood. 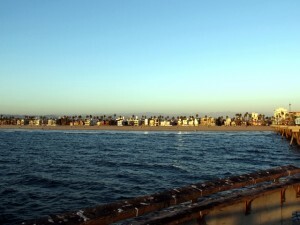 It’s been nine years since I moved away from Venice Beach. My quick impression is that little has changed since I left, except for the addition of some medical marijuana dispensaries. Who says nothing ever changes for the better? Zooming in from a good perch on the pier, I was able to snap a shot of my former front door, indicated by the little yellow arrow. I still remember my first night there. It had taken me until well after midnight to finish moving in, and I had some corporate obligations that required I get up at a quarter to six. When I woke up, instantly I noticed the roar of the pounding surf a hundred yards away. That sound, and the immediately refreshing ocean air, are the two things I miss most about Venice Beach. 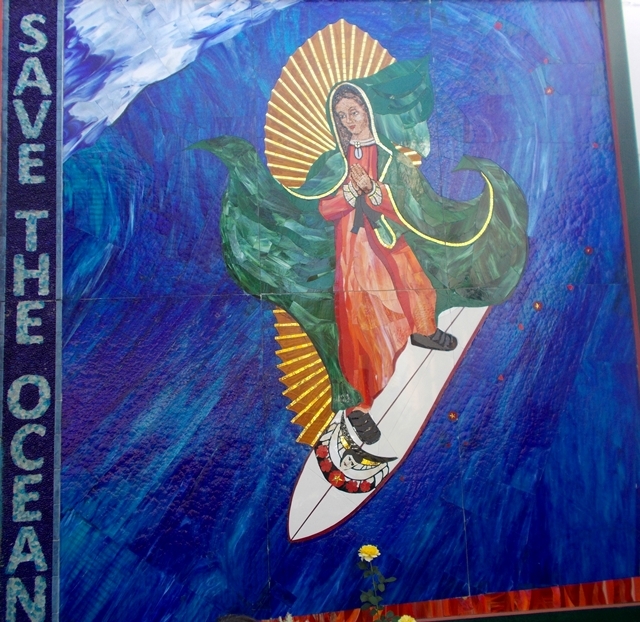 These days my place at Ocean Beach is quite reminiscent of my old haunts at Venice. I’m not quite so close to the water but still close enough to hear it and to enjoy the taste of the air. 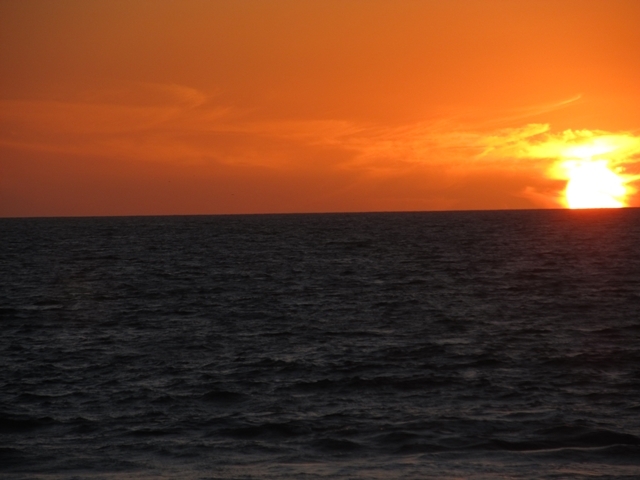 It isn’t possible to witness too many sunsets at the beach. Here is the latest addition to our collection! Patrick’s Point State Park is one of the most glorious places in Humboldt County, even though most of the trees are not giant redwoods. 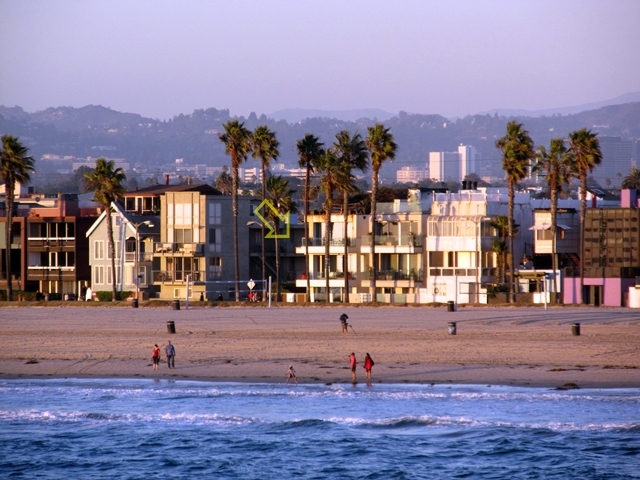 It is widely known for its stunning ocean views and spectacular essence. I don’t think I’ve ever felt more at home anywhere else; I wrote about it once before, in August, 2007, and included more conventional pictures. This afternoon, Alexis and I hiked the rim trail of Patrick’s Point, which was cut by the Yurok Tribe hundreds of years ago. According to their tradition, the Dolphin Spirit took up residence here when humanity took over the surface of Earth. Personally, I suspect they’re on to something. Go there someday and see for yourself. It was fairly late afternoon, and stretches of the path were brightly lit up by sunshine. Here is one of two snakes we saw during the hike. This one was about 18 inches long. Maybe somehow he knew the law protects him from human aggression, because he didn’t seem intimidated by a couple of people. No doubt plenty of other creatures are eager to have him for their next meal. It’s hard not to notice that this is the second fairly recent serpent-related entry. Is there a symbolic meaning in this? Given my many lizard sightings over the years, (see this, and this, also this, maybe this, and this, and especially this), it’s hard not to see these snake visitations as some sort of escalation of the primal forces. Somehow it feels like a positive and somehow appropriate development. Shinrin-yoku is the Japanese practice of forest bathing. Count me among the “early adopeters” of this therapy! Like many lawyers, I have a keen sense of what constitutes good medical practice — and I am 100% sure that hanging out in a forest has tangible medical benefits. 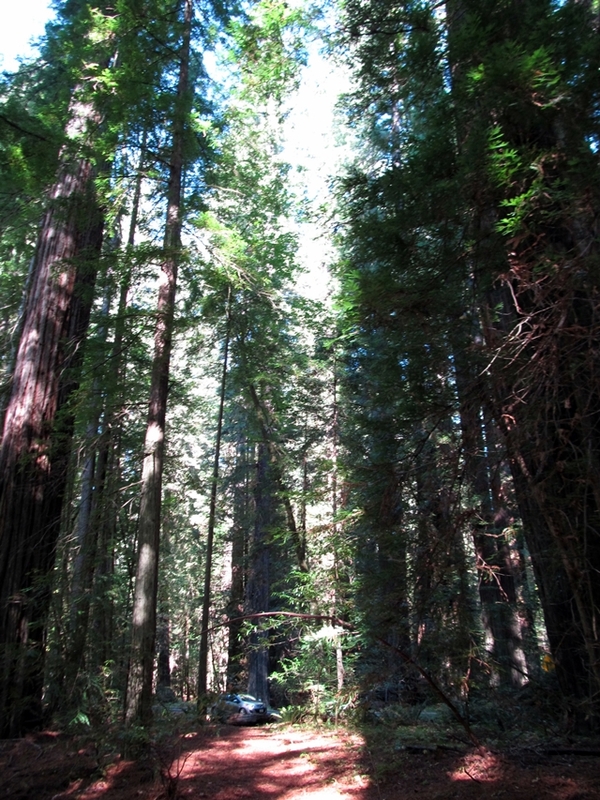 If you’re into experimenting a little with shinrin-yoku, I recommend going to Avenue of the Giants. Other beach communities are worried about litter and parking problems. Here is a fine picture of Lana May and me right after we wrapped up an hour on a jet ski. Look how happy she is! We are celebrating her 15th birthday. It was the first time she ever really got to drive a powerful vehicle. Lana got skillful quickly and loves going fast. The good news is that she didn’t go too fast for me. I’ve always enjoyed speed. 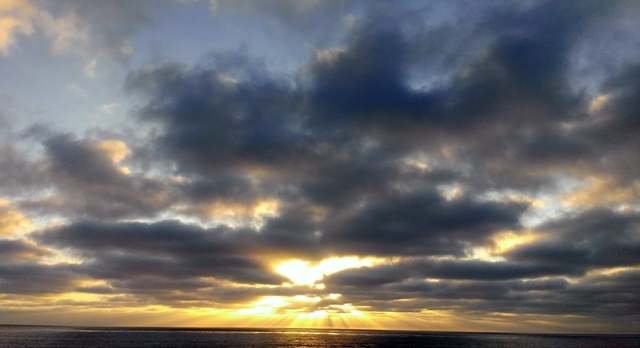 Carlsbad Lagoon is a great place to have fun on the water. We also enjoyed perfect weather. Remember the first time you got to drive something that would go a lot faster than a bicycle? I was less than two months past my 11th birthday when I started hanging out with my uncle’s motorcycle racing crew. Now I have reached the age where I’d just as soon have somebody else do the driving. It’s good to know that Lana is capable. 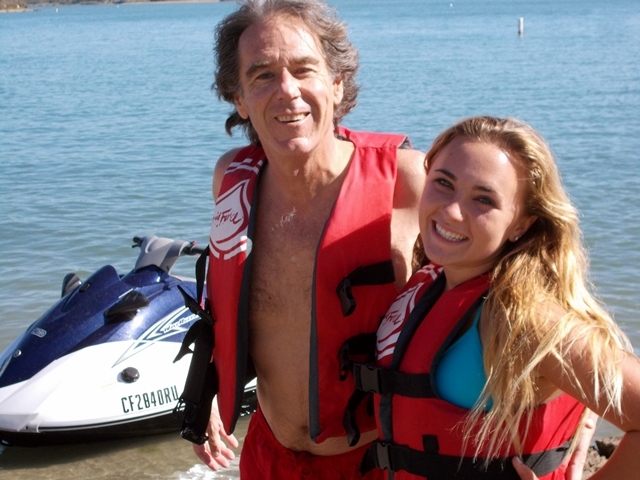 It’s also nice that she enjoys going fast, although it means I am going to recommend that she drive a 1977 AMC Gremlin with a slightly damaged engine when she turns 16 in a year. Alexis took us out for coffee afterwards. 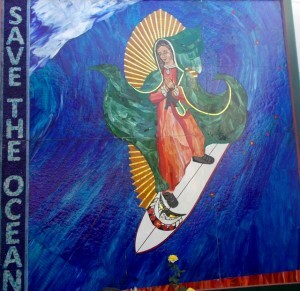 We got to sip beneath the protective presence of the Surfing Madonna! It is about time America confronted its own sordid history. The textbooks we use in schools today leave out most of the really interesting and important stuff. I guess our masters don’t think we’re capable of handling the truth, or maybe they figure it is easier for them to manage a confused and ignorant herd. For example, the era popular culture thinks of as “the 60s” actually dates from late 1963, when President Kennedy was assassinated, through August of 1974, when President Nixon resigned. Establishment history explains that a lone nut named Oswald murdered the President in Dallas. It goes on to explain that Richard Nixon resigned from office in disgrace as a result of the Watergate scandal. Counterculture history tells us that Kennedy was murdered by the military-industrial complex that President Eisenhower warned us about, and it acknowledges that there was a lot more to Watergate than is evident at the surface. You know, Malcolm X explained that the U.S. media had a habit of getting the American People to debate among themselves about which of two big lies actually is true. The man had a very important point, but even Malcolm failed to grasp the gravity of the situation our society found itself in 50 years ago. The grim truth is that world society has been subverted from within by a massive Ape conspiracy! Where do they come from? That’s a good question, but educated opinion suggests they come from the future, from a time when apes have mastered humanity and seized time-travel technology for their own sinister purposes. Apparently the Apes began intervening in human events shortly after the end of the First World War. Benito Mussolini was one of the first major world leaders to fall under their control. The Apes supported both sides during the Second World War, knowing that they would have an easier time taking over if humanity stayed busy wiping itself out for a few years. After World War Two, the Apes were responsible for the Cold War as they further consolidated their conrol over Earth. Americans were shocked by President Eisenhower’s warning about the military-industrial complex, but even Ike was afraid to level with the American People and tell them the honest truth about the nature of the threat faced by our society. Today there is a lot of talk about zombies in our popular culture. Once again we are collectively afraid to face the truth: zombies are not un-dead, they are humans who have suffered grave and ultimately fatal genetic damage as a result of Ape intervention. It’s just part of the same old “divide and conquer” strategy that has served them so well for decades. 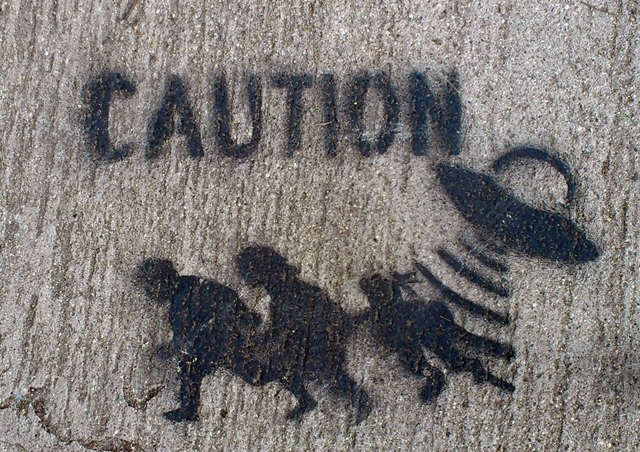 Many people have suspected these truths for years, but things are getting so bad these days that maybe our society is ready to wake up and confront reality. I’ve hinted about it before. For example, several years ago I reported about the zombie uprising in Hollywood back in 1972. Today I am going to explain more of this important hidden history. It’s true that I, along with a number of other athletic young adolescents, were sent to fight the zombies that were feasting on the small brains found in the Hollywood Hills. What I didn’t explain was that the zombies were sent to attack Hollywood in the fall of 1972 because a key Ape political figure had been taken hostage just a couple of months earlier. That’s what the picture that goes along with this story is all about. I led a secret team that included Eileen Becker, also pictured. 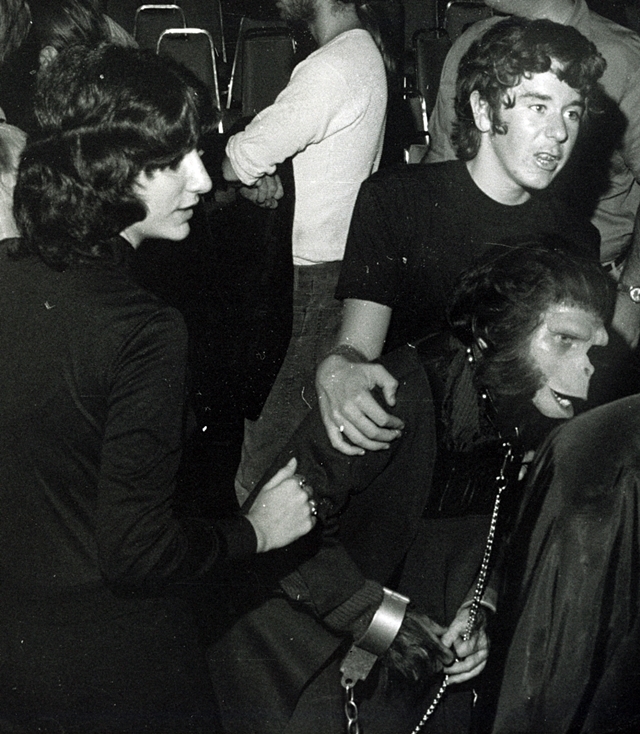 We captured this Ape, named Paula Crist, at the 1972 World Science Fiction Convention in Anaheim, California. This picture shows us taking the Ape into custody. Obviously the Apes did not take this development lying down. They figured that a small group of kids and dissident adults from Hollywood should not be allowed to interfere with their larger plans for our society. What they did not know at the time was that elements high in the Nixon administration were adamantly opposed to the continuing Ape influence, despite the massive covert support given to the Nixon campaign by the Ape underground. 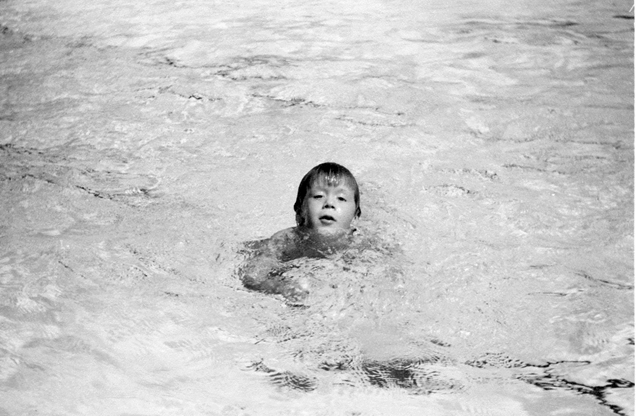 Paula was released from the cave she was held captive in the day President Nixon was re-elected, as a sign of good faith. Nixon intended to finish President Kennedy’s efforts to secure peace and disarmament during his second term, but the Apes had other plans. Since Nixon had served them so well, they disgraced him rather than ordering him assassinated. A lot of things make more sense now, don’t they? You wonder why America has abandoned any trace of egalitarian values, why she seems to be embracing fascism more every day? Blame it on the chimps!